I began this post in 2011. Every time I started working on it I went to a dark place and couldn’t go on. That year had that profound an effect on my life. It changed me. Most of the people around me couldn’t even fathom being that upset over a few cancelled video games, of all things. It was a hard time to want to carry on being myself. Four years have passed now. I’m not ashamed to say I’m feeling quite a ways better about things. Bit by bit I’ve been reclaiming my hobbies, despite what feels like continuous setbacks any time hope rears its rounded yellow head. I feel like acknowledging and thanking the faceless people that shared my pain then and make me feel inspired now. This one goes out to all those campaigning and fighting to make sure Legends Never Die for these past 4 years, and the 11 years before that. Here’s a treat to fill your bellies and refresh your spirits. 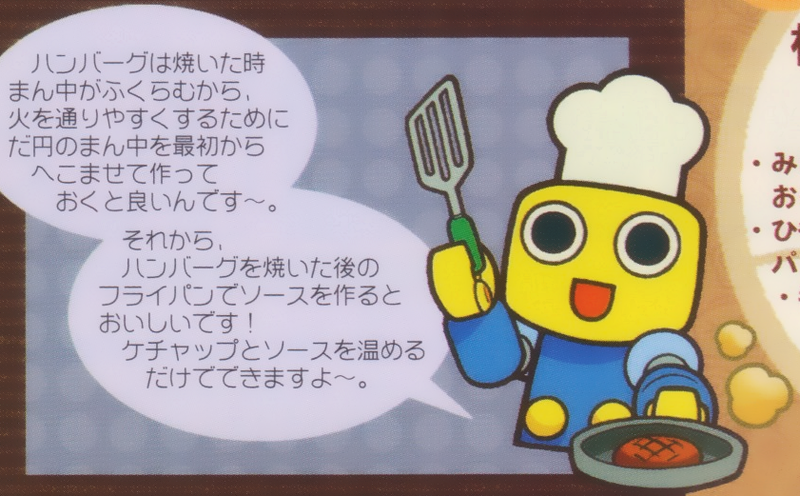 A recipe by Servbots, for Servbots! From the pages of CAP! 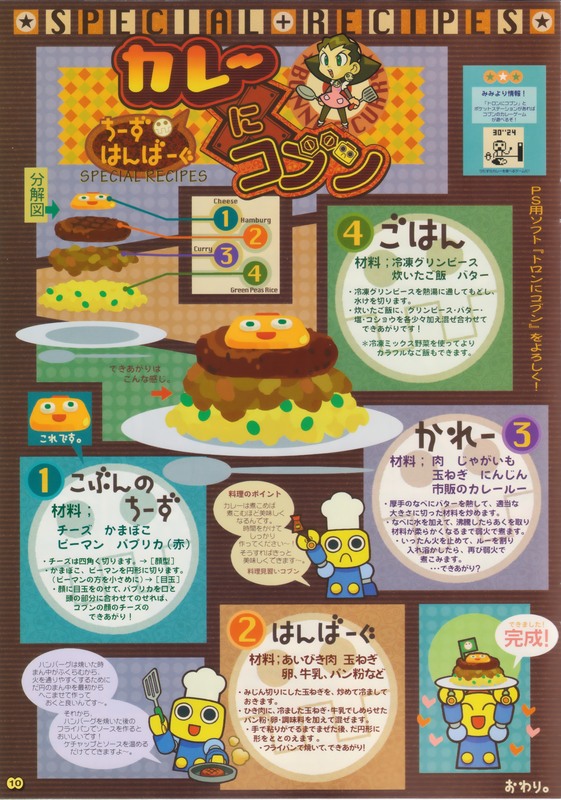 magazine, welcome to Curry Ni Kobun! For the head, take a square slice of cheese and cut the corners into curves. For the eyes, shape the kamaboko into large circles and chop the pimiento into smaller circles. Place the eyes over the cheese and use a slice of red pepper for the mouth and presto, your kobun head is complete! Ingredients: Minced Beef, Onion, Egg, Milk, Breadcrumbs, Etc. Saute finely diced onions in a pan, allowing them to cool. Mix the minced beef in with the cooled onions, moisten it with milk and add in the breadcrumbs, egg, and any extra desired seasonings while stirring. Once the mixture is thick enough to work with your hands, shape it into a disc. Cook it up in the fry pan, and you’re finished! *Substitute for mixed frozen vegetables for a little more variety! Heat up some butter in a thick sturdy pot, then start cutting your ingredients into suitable slices and piling them in. Add in some water and allow it to boil, then reduce to a low heat and simmer until the ingredients get nice and soft. Take off the heat when stirring in the curry mix, then set it back on a low heat until it is warmed evenly. 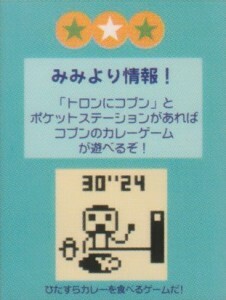 …All set? Heat the frozen peas in a pot of boiling water, then drain the water out. Take your rice and mix in the peas with some butter and a dash of salt and pepper, and voila! 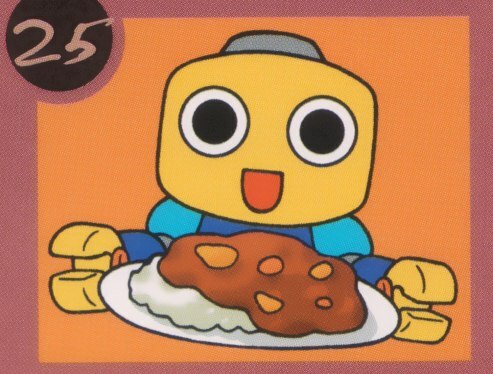 If you have Tron ni Kobun and a Pocketstation, you can play the the Kobuns’ Curry Game! 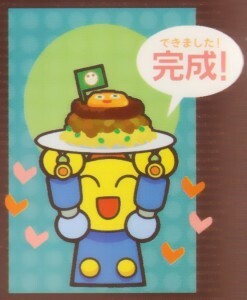 It’s an honest to goodness curry eating game! Please support “Tron Ni Kobun” on the Playstation! This recipe was of course made in Japan, so it assumes you have a rice cooker already. You can also make rice by boiling water in a pan, adding in the rice and letting that come to a boil, then simmer at low heat stirring occasionally until all the water is absorbed — usually around 2 cups water per 1 cup of rice. 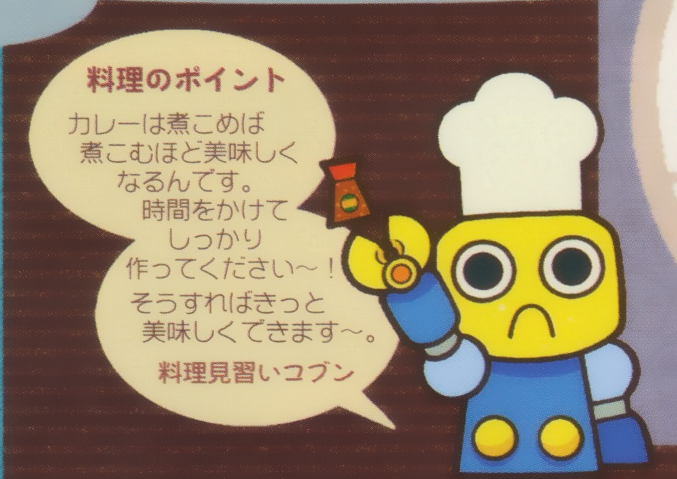 Curry mix can range from mild to super spicy, some people even add in hot sauce. I’m no genius at cooking by any means, but I imagine if processed fish paste slices and hot peppers aren’t your thing, you can substitute a white cheese or mayo for the eyes with olives or ketchup as pupils and a slice of tomato for the mouth. Remember that every Servbot has its own unique tastes, so I encourage you to feel free to experiment and find your own perfect Kobun Curry recipe! 3 Comments to "Food for the troops!" 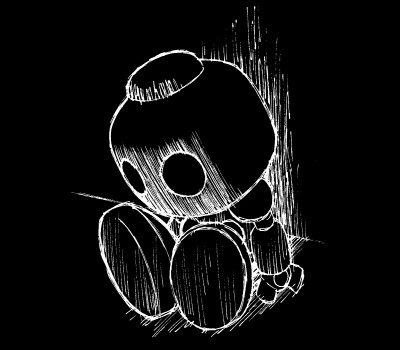 Hey, don’t depress #20, I am the admin of the spanish-language Mega Man wikia, http://es.megaman.wikia.com/wiki/Usuario:Rockyou78, so I understand you, I was really sad about 4 years ago, but all is better in the future. 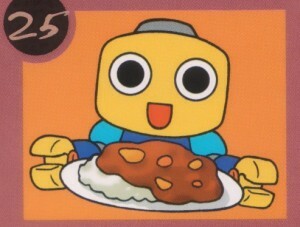 I am the worst at cooking, but making cheese into a Servbot face could be fun… I’ll definitely keep this in mind!